Get tickets to Closing Day & USPA Spreckels Cup before they sell out! Closing Day of 2014 San Diego Polo Club Season. 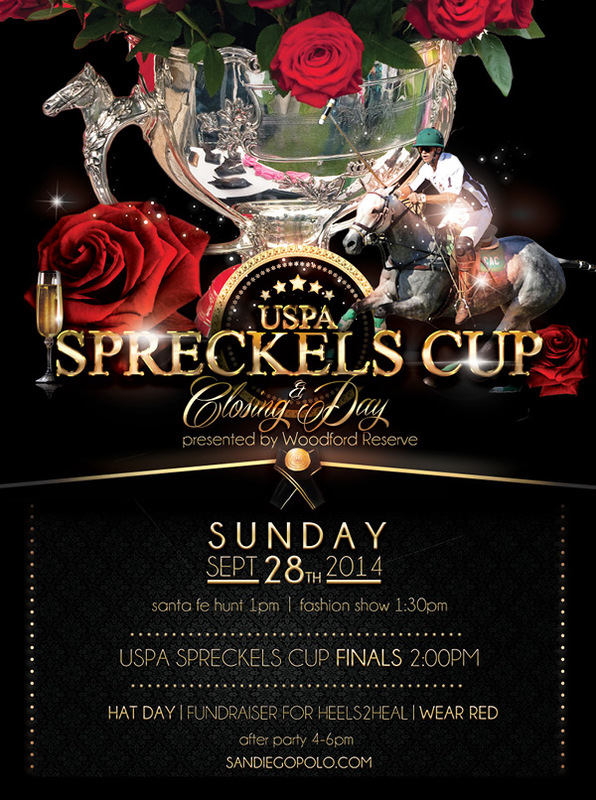 Local and international polo players will compete for the 105-year-old USPA sanctioned and highly anticipated Spreckels Cup trophy in front of an estimated 1,500 spectators onSunday, September 28, 2014 at 2:00pm. We have a great day lined up, starting 1:00pm with a classic fox hunter and hound demonstration. Immediately following the equestrian show at 1:30pm, Zen Fashionista Sonya Berg is hosting a fashion show with San Diego celebrity models, including Miss California and San Diego Newscasters from CW 6, KUSI & Fox 5.The featured entertainment and grand finale of the 2014 polo season begins promptly at 2:00pm with the USPA Spreckels Cup Finals, where two teams will battle it out for the prestigious Spreckels trophy.Enjoy a champagne divot stomp during half time and 7th Chukker After Party with DJ Beatnick immediately following the match.Don't forget to wear red and your favorite hat.